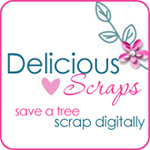 Delicious Scraps: Paper Templates Tutorial and a Freebie! Paper Templates Tutorial and a Freebie! Thank you all for answering my poll. I will continue making CU items and kits. I also have started my tutorial blog as well. Leave me a comment here on which tutorials you would like to see. Also I have a free Layered Flower Paper Template at my tutorial blog. If somehow you know how to make fetl elements (not felt texture), it would be one of the most interesting tutorial !! myscrapbook says; thank you for the template and the lovely tiramisu kit. We can't wait to see any tutorials by you. Thank you so much for taking the time to share your talent with us! Thank you for this new tutorial blog. I would like to know how to make bows. I bought a tuto, but without picture, I'm very lost. I would LOVE to see a tutorial on how to make a Photoshop action...I have been wanting to learn how to do it for a while now!